We are each individuals within a multitude of individuals. Ant medicine asks how do you set yourself apart to express the uniqueness of your soul? Does your uniqueness bring you a greater sense of community or has it caused a painful isolation from those who want to care and support you? An ant alone covers about five eighths of an inch of Earth. She is tiny. 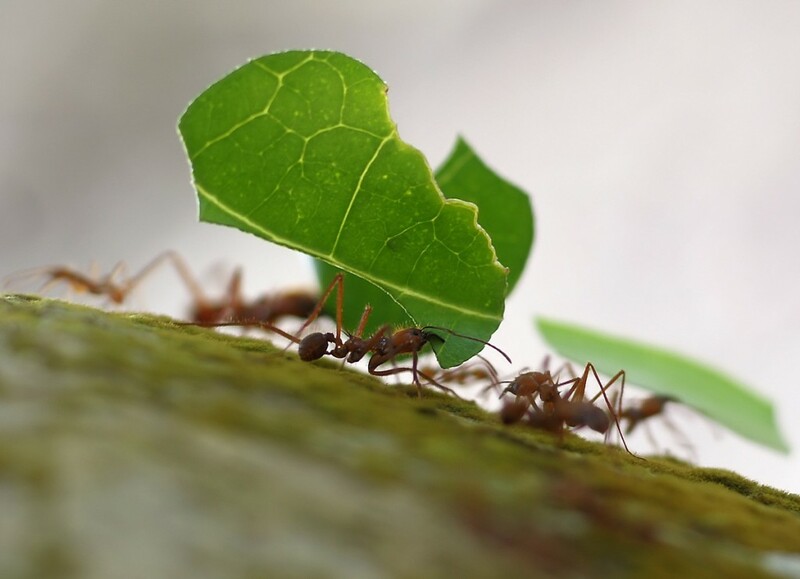 Ant in her colony can cover miles of land and can strip a crop in a matter of minutes. Her visible teaching is the age old wisdom of power in numbers. If Ant medicine has marched into your life, this is no time to go it alone. The task at hand is much, much bigger than you so let go of any need to claim personal credit for what the collective enables you to do. As humans, we have the capacity to learn anything. But we can not master everything. Mastery comes from focus on a clearly defined specialty. Choose which hat you want to wear and share the rest of the wardrobe. Healthy group dynamic occurs when each person involved understands their specific field of experts and graciously yields to another when their specialized knowledge reaches its limits. In this way all are equal leaders serving the function of the larger event unfolding. Watch the end credits of a movie and you will see Ant Medicine at work. Ant lives in underground mansions of astounding architectural skill and detail. Her medicine teaches us that what you see ‘top-side’ in your life is directly caused by conditions below the surface. Our conscious minds are filled with content from the multi-chambered resource of our sub conscious mind. Ant invites you to improve subconscious conditions by journeying down into the powers of the insect nation. She is an invitation into the depths of the riches within, but unlike Bear, who enters her cave alone, Ant suggests you travel together into the Great Mystery so that conversations can be your learning tools. The conversations will be strange and unpredictable. But such is the effect that insect energies have on mammal energies. Ants are chefs and farmers. When you see them milling about on your picnic blanket, hauling away crumbs, they are not interested in the food as you’ve dropped it. They want to ‘cook’ it in their underground kitchens. After lodging a bit of bread or corn into their kitchen walls, the ants wait patiently for the darkness to bring a tasty mold for them to dine on. In this way, they are alchemists, able to take something into their life that may not be inherently useful, embed it into their house energies and wait for the thing to become useful. The plant spirit medicine of mold is in partnership with Ant medicine and it teaches of the psychedelic dimensions of Earth. The insect nation is in direct communication with such dimensions which is why it is often very disconcerting to encounter Dragonfly, Ant, Spider, and all the other tiny crawlers of Earth. The relentless and ruthless gaze from an insect medicine person can send an unassuming mammal into cosmic confusion if they are not aware of the subterranean energies at play. Ants, like many insects, live deep in the body of Earth. Earth is a living being… a very very large living being. As you are made of skin, blood and bones, she is made of water, rock, fire and air. This planet being holds a strangeness that can only be experienced when we descend into her materials. Ant is the travel guide into that journey. The tiny ant is the servant to the enormous spinning sphere we live on. And as a servant of Earth, each ant carries a wisdom of Earths reality up from the tunnels into the light of day for us to glimpse. The requirements of such a task can often lead people to view Ant Medicine people as ‘heartless’ automated creatures with no emotion. While it is true there will not be long cozy talks by the fire when dealing with an insect energy, it is not because Ant Medicine people are heartless. It is because such things are irrelevant for the situation at hand. Insects are a perfect expression of form equalling function. Their appearance equals the task at hand. When insect medicine turns up in a situation it is time to set aside the need for affection and reassurances and shift into the machine that will get the job done. It is not a heartless machine. Ant medicine has mastered compassion to the point of making further discussion or exhibitions of it unnecessary. When the machine of the collective is ticking in perfect time, there is no greater expression of love and compassion than the product of that creative harmony. Ant is comfortable with the silent knowing of connected hearts. If Ant Medicine is out of balance, you may have lost a connection to why you belong where you are. What is your role and task in the situation and do you want to be a part of it? Is it time to leave the group and reevaluate the direction your soul wants to travel in? Or is it time for that lone soul to find the courage to join the group that will bring your goals into reality? Or, practically speaking, you may need to drink Kumbuchu or make yourself a mushroom omelet. Conversely, you may need to pull the curtains back and let some sunlight dry up any excessive moisture causing mold or fungus to grow. If it is time to journey out of the safety of the collective to reevaluate what your unique being needs to do to stay on a truthful path, Ant Medicine says, beat a drum, or listen to shamanic drumming to call on the protection you need while on your own. Play the drum softly in your room or loudly in your car as your adventures unfold. The resonant heart beat of the drum will create a buffer of resonance around your body, mind, and soul which will protect you as you explore new diminsions on your own.